PITTSBURG, CA--(Marketwire - Feb 17, 2012) - Boosted by remarkable sales that prompted the early release of a new phase to accommodate demand, Venue by William Lyon Homes is the most popular address in town. Prices from the low $300,000s have made Venue the fastest-selling new neighborhood in Pittsburg and demand is through the roof. 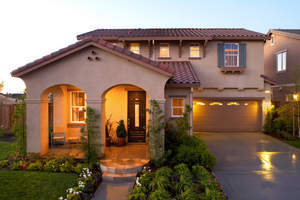 With two-story floorplans ranging from approximately 2,013 to 2,515 square feet and some of the best home sites for sale, smart consumers should hurry in to take advantage of these great opportunities in the community of Vista Del Mar while they last. "One of the best things about purchasing in the latest phase is the ability to personalize a favorite Venue design to best fit one's lifestyle and preferences -- and have plenty of time to organize a spring move," said Lesley Pennington, Vice President of Sales for William Lyon Homes. "While there is still flexibility for buyers to make these exciting decisions, it is beneficial to act sooner than later, before this phase is completely sold-out. These floorplans also offer elevated lot locations with views toward the delta and generous yards that are perfect for family barbecues and children's play areas. Buyers who prefer a quick escrow can also be accommodated when they choose from the neighborhood's limited selection of move-in ready floorplans that come complete with stainless steel appliances, tile, upgraded cabinets and more." Historically low interest rates and attainable pricing make Venue an exceptional value. A great location within close proximity to BART and Highway 4 also means a shorter commute to work, San Francisco and the East Bay, allowing buyers more time to enjoy their life. It's all here, so visit now or get connected instantly by clicking on www.lyonhomes.com/venue. Venue's single-family detached floorplans offer up to five bedrooms, three bathrooms, two-car garages and front porches. All new construction, state-of-the-art amenities and long-term warranties give buyers the confidence and peace of mind they deserve, knowing their builder is with them now and down the road. The neighborhood's convenient Pittsburg location puts residents within easy access of shopping, dining and entertainment destinations -- abundant opportunities for outdoor recreation include landscaped parks the picturesque 18-hole Delta View Golf Course. The city also hosts popular civic events that range from art shows to hometown parades and residents can enjoy weekends at the beautiful new Old Town and Marina District. Venue is included within the Mt. Diablo Unified School District; students will attend Delta View Elementary, Riverview Middle School and Mt. Diablo High School. During a visit to the models and sales gallery, visitors should inquire about fixed rate FHA financing that requires only 3.5% down, as well as the advantage of VA and Conventional loan options. FHA, VA and Conventional program guidelines and loan limits are subject to change. All loans subject to credit approval; restrictions may apply. Down payment, payment terms and rates vary based on market conditions and qualifying requirements. A 3% Broker Referral Fee is offered at Venue. Brokers must bring their client on their first visit to register. Broker Referral Fee to be paid at the close of escrow. It matters who your builder is, and William Lyon Homes means it when they say that they put themselves into their homes. They build each and every home as if it were their own and have earned a solid track record for constructing homes throughout the West since 1954. Learn more by visiting www.lyonhomes.com for updated information on William Lyon Homes' new neighborhoods. To visit Venue, take Highway 4 east toward Stockton/ Pittsburg, exit on San Marco Boulevard, make a right, left onto W. Leland Road and right onto Tomales Bay Drive. The Models will be on the right. From Highway 4 west toward Concord, exit on San Marco Boulevard, make a left, then left onto W. Leland Road and turn right onto Tomales Bay Drive. The models and sales gallery are open daily from 10 a.m. to 5 p.m. For more information on Venue, please call 925-261-0983. Prices are effective as of the date of publication. All homes are subject to prior sale. Prices and availability of homes are subject to change without notice. DRE Officer License: 00982816.